MusicRecordShop.com Deal Of The Day! Don't fight the crowds today! Our friend Mark at www.musicrecordshop.com has come up with some exclusive deals for the faithful readers of the CVR blog. We will have a 'deal of the day' being posted everyday for the next 4 days, so if you have a music lover on your Christmas list, look no further! Here is today's deal, just add the code CVRVINYL at checkout and receive a 10% discount on your order! 2012 three vinyl LP live release from the Australian Hard Rock legends, their first live album in 20 years. AC/DC Live At River Plate was recorded in Buenos Aires in December 2009 when nearly 200,000 fans (over three sold-out nights) thunderously welcomed AC/DC back after a 13-year absence from Argentina. This ultimate live recording chronicles one of the largest shows from their massively successful Black Ice World Tour (where they performed to over 5 million fans in 108 cities in over 28 countries). 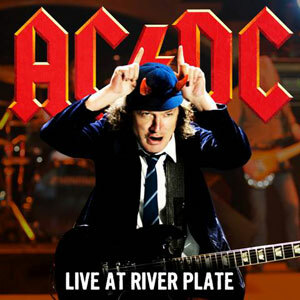 The 19 tracks on AC/DC Live At River Plate span AC/DC's extensive repertoire, including old and new classics like "Back In Black," "Thunderstruck," "You Shook Me All Night Long" and "Rock N Roll Train". Order Your Copy Today at MusicRecordShop.com!